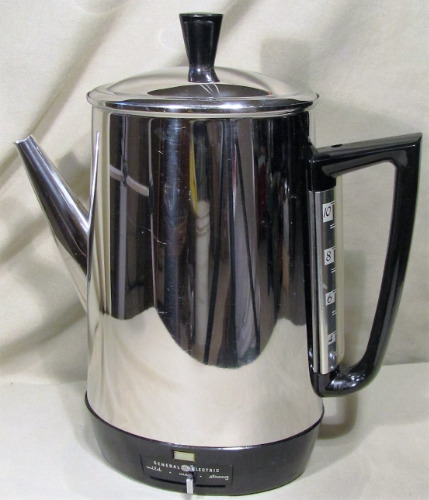 An absolutely fantastic percolator engineered perfectly. Made in Bridgeport, Connecticut by General Electric in late 1970s and early 80's. It was a popular model for many reasons. 3 to 10 cups, all stainless steel construction, easy to clean, easy to use. Pours like a dream. Adjustable temperature, sight tube for water level (easy to see where it is), basket marked for grounds levels, a light comes on when ready and its in mint condition. Absolutely a great pot in perfect working order and ready to work. GE engineers did a fantastic job with this. It brews a full 10 cups to 199 degrees F (strong setting) in 13 minutes. Mild is 180 degrees in 10 minutes. Still as handsome and practical as ever.